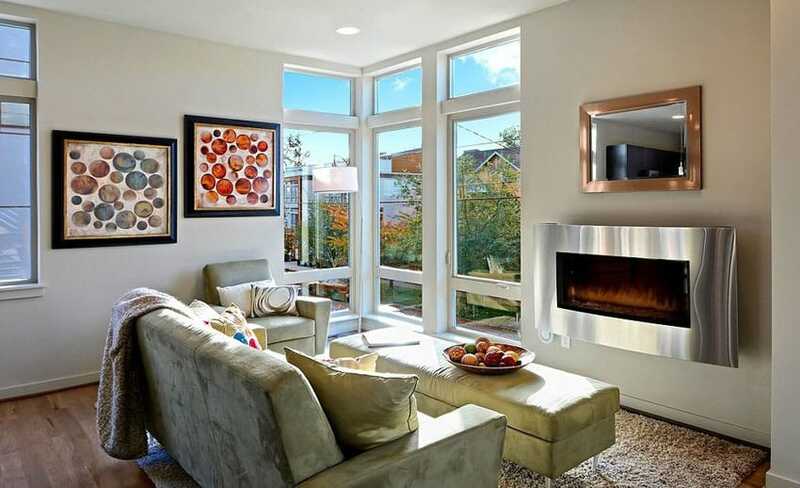 This gallery showcases beautiful small living rooms in a variety of design styles. Decorating small living rooms can be a challenge due to their limited space. These pictures feature creative interior design ideas for getting the most out of a small living room layout. Warmth is important in the main lounge area of the modern-day interior. 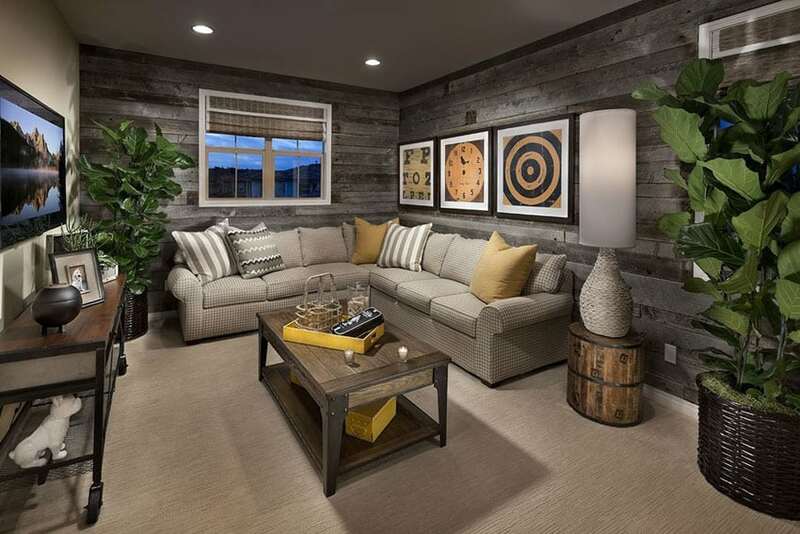 In the image above the wooden gray stained ash accent walls pair well with the various industrial re-purposed wooden furniture. The carpeted floor, bright pin lights, and wide single-hung windows all create a spacious and welcoming ambiance in this living room. This is also a good example of using flora to enhance the feel of a space, seen here in the houseplants used to liven up this living room. Creating a small living room design can be a challenge to provide enough space for quests without thing feeling too crowded. The furniture you purchase, and how you position it can have a big impact on maximizing your space. Rather than buying large furniture, you may want to opt for smaller scale pieces. You could try getting a loveseat and chairs instead of a full size sofa. Antique furniture can be a good choice for a smaller room, since the average room used to be much smaller in the past. The layout is another way to get the most out of your small living room. Try arranging your furniture around a center ottoman rather than a coffee table to save space. The ottoman can also act as another seat when you have extra guests over. In addition you can keep things bright and airy by adding mirrors and lighter color theme that reflects light and gives the impression of a larger space. 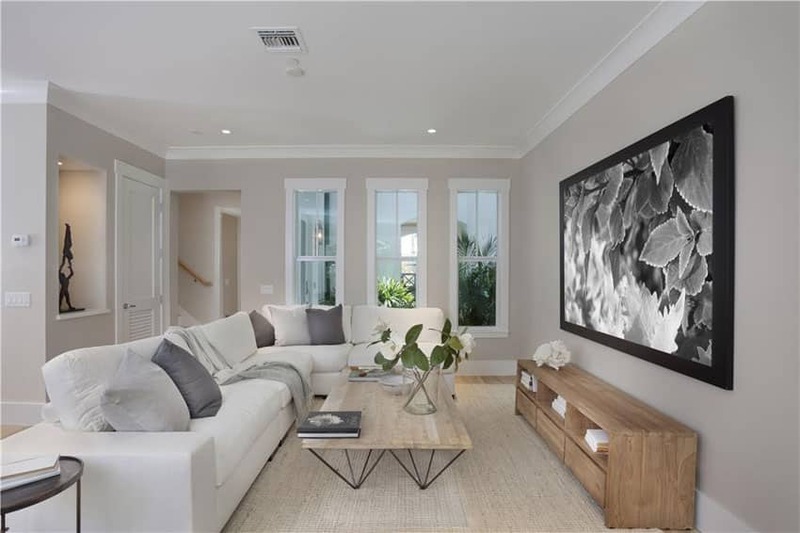 The teak hardwood floor, gas fireplace, and intelligently placed wall-height corner windows define what this living room is – a quiet yet open place for much needed R&R. The wall mirror helps make the room feel roomier still. The microfiber English couch, armchair, and ottoman add a nice final touch of homey comfort to the room. Living rooms need to be bright and have an open feeling about them. 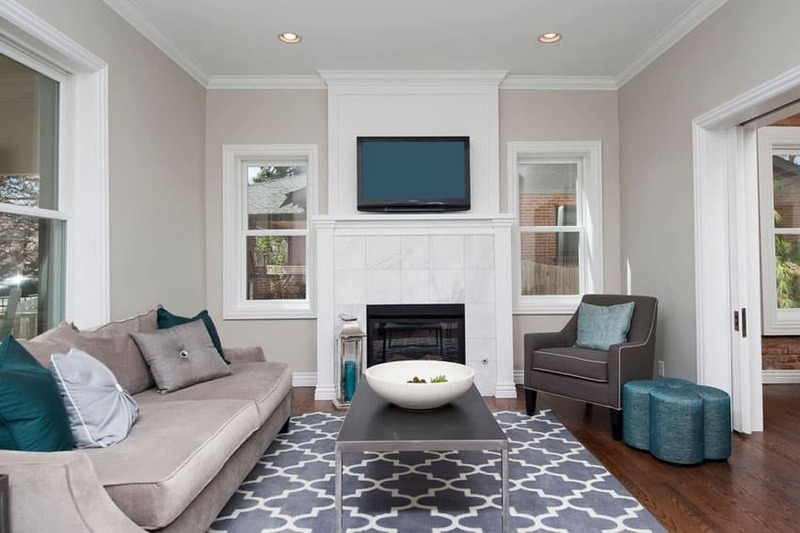 The white accent crown molding that frames the gray painted walls; the bright floor rug laid out on the wooden floor boards; the tall, glass windows; and the long white leather contemporary sectional sofa all keep the room feeling light and open. The wood plank furniture and the classy hung black and white photo give the room a nice personal touch. A balance of colors makes or breaks a living room space. The deeply-stained pine hardwood flooring, with its rich dark browns, and the mid-gray tones of the dry walls are capped off nicely by the whites of the ceiling, baseboards, and large curtained windows that adorn the space. The white tufted Barcelona lounge chairs, the choice of metal and glass side tables, and the brown tufted long sofa, with the thick frieze rug, all serve as smart decors for this nice example of a balanced living room design. Fireplaces, more often than not, are considered to be the heart of any living space. This white Carrara marble fireplace accented by the crown moldings that frame it is the centerpiece of this area. The wide windows (with the same crown moldings) and the gray painted walls complete the openness of the room. The pine hardwood floor gives a much-appreciated warmth to the space. 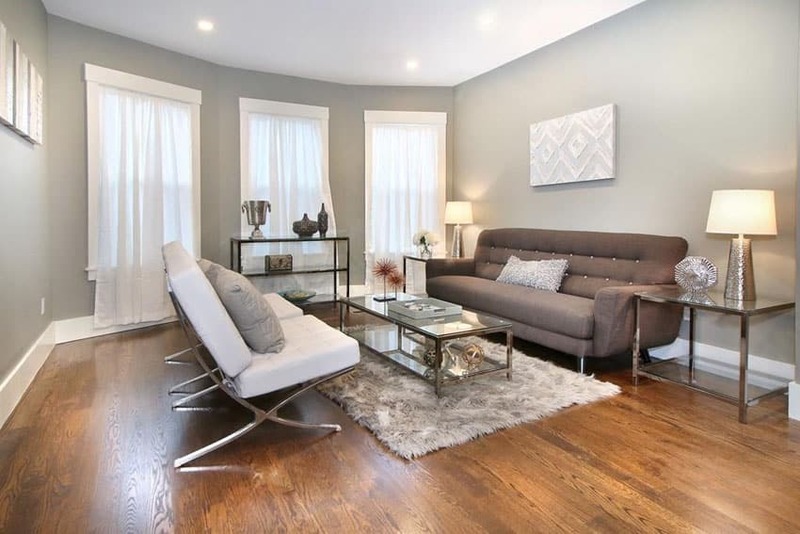 The upholstered seating furniture of different shades of gray, as well as the minimalist rectangular coffee table and the gray and white rug, top off this brilliant piece of design. 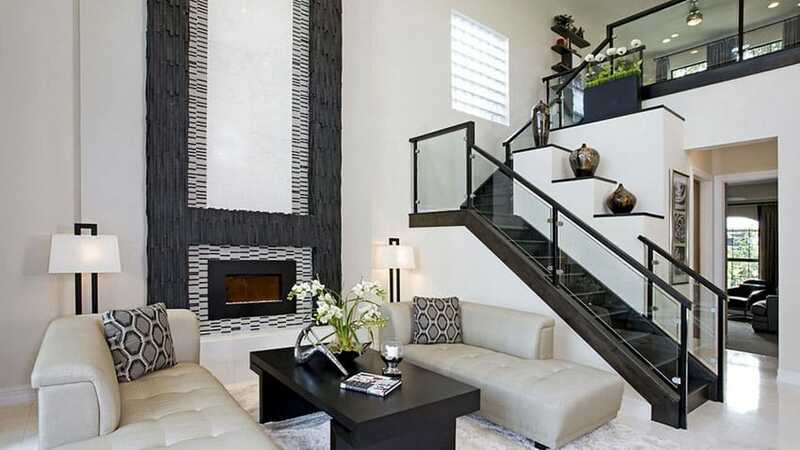 The gas fireplace in this example of living room design, is accented with black and gray porcelain wall tiles. 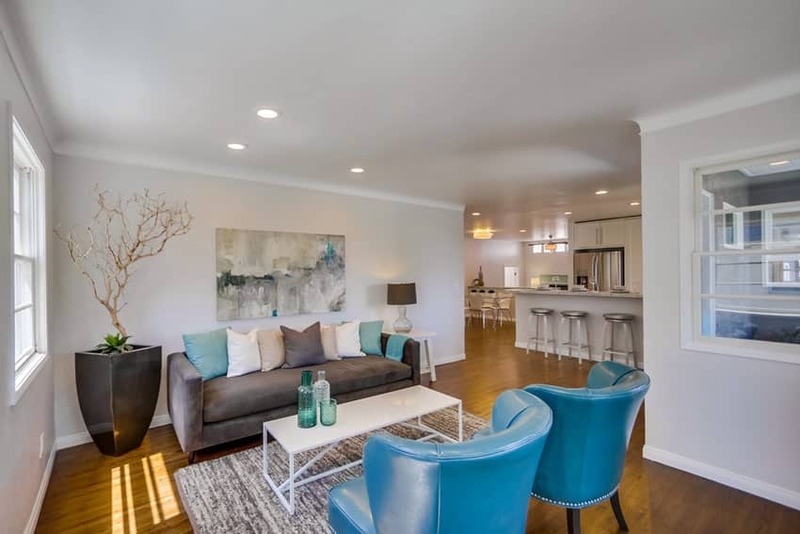 The mahogany wood flooring pairs well with the mid-century modern style of designed seating; the leather wheeled coffee table is also a nice touch. The motif of red and white used in the seat upholstery, throw cushions, and rug also add a bold splash of color to the space. Living rooms located on the upper levels of apartment buildings wisely use the views from that height to their full advantage; they have a unique opportunity to add large windows that let in sufficient daylight in but still keep the privacy that home spaces need. 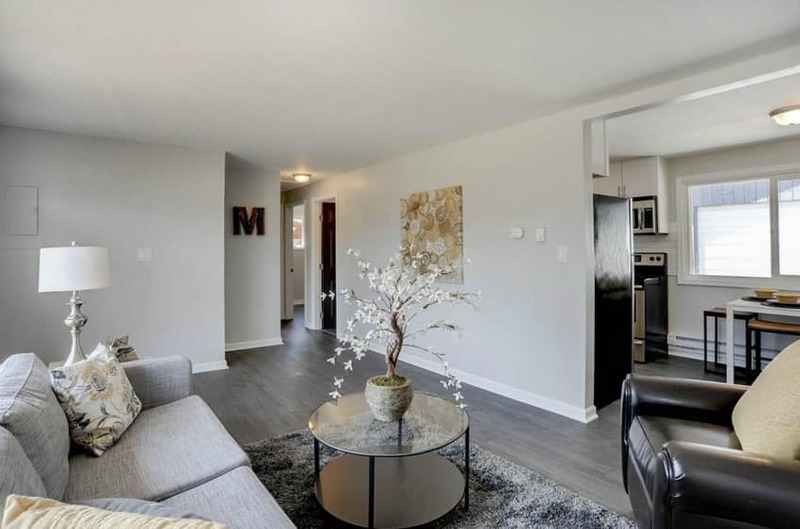 Everything in the space serves to heighten that feeling of openness – from the polished hickory wooden floor to the quaint yet smart selection of furniture. 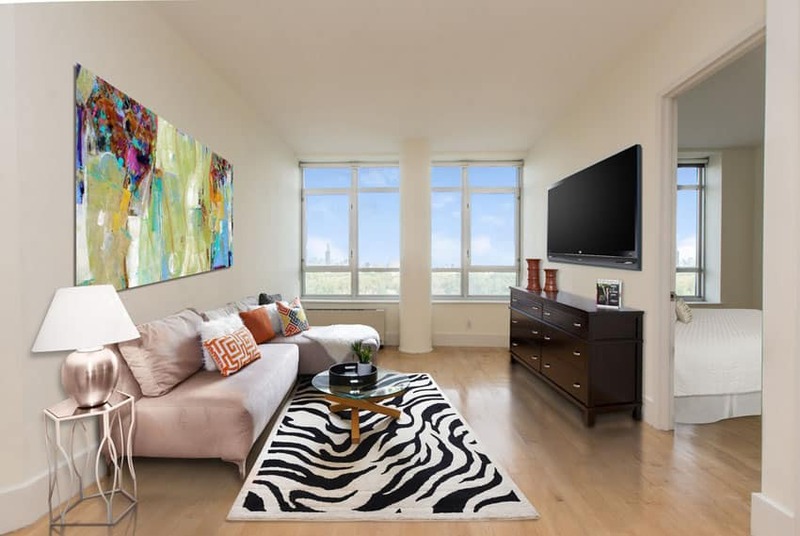 The hung painting at the back wall, the zebra skin patterned rug, and the patterned throw cushions all also add a splash of personality to the room. The white-painted brick on the masonry wood-burning fireplace combines the rustic texture of brick with the light airiness of white paint. 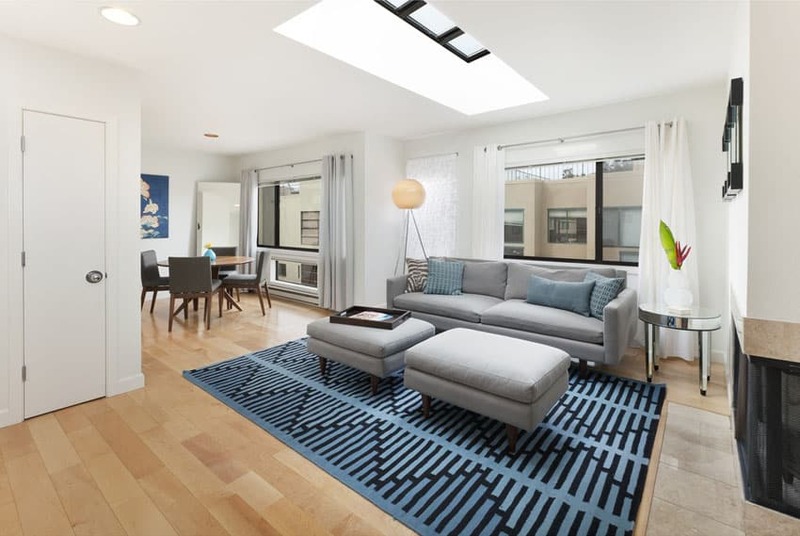 The single hung windows only add to the feeling of brightness in the space. The loop-pile carpeted floor, wood and steel table, and dark brown armchair give a touch of richness to the feel of the room. 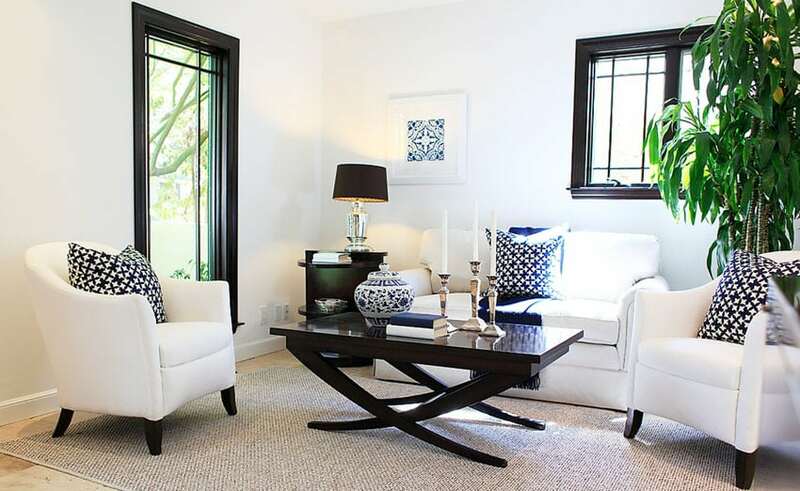 The white sofa and the black and white striped throw pillows are also a smart choice of decor for the space. Grays and whites pair well and help keep a room from feeling cluttered or stuffy. 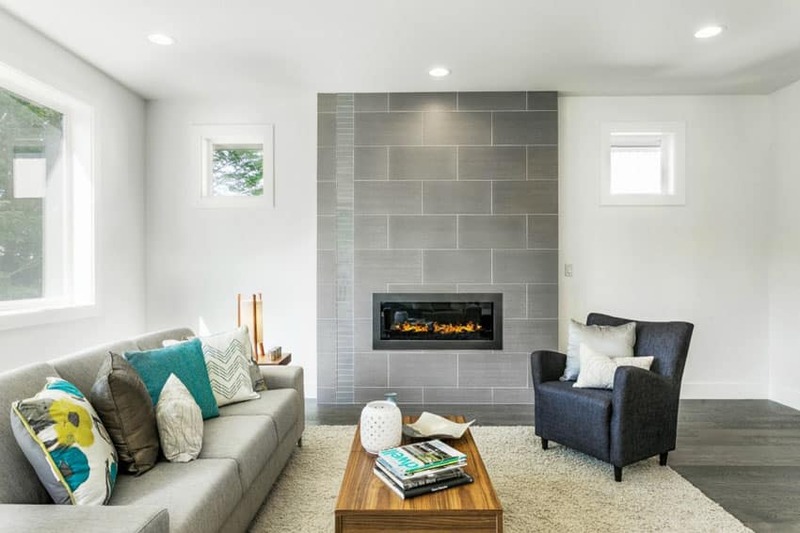 The gray porcelain tiles on the contemporary gas fireplace and the gray stained engineered hardwood floor serve as the grays in the area that partner up well with the off-whites of the painted walls and casement window frames. The twist pile carpet, choice of modern furniture, and the bright and bold patterns on the throw cushions, serve as nice garnishing to the overall taste of this living room design. Living rooms are often used a transition space that bridge the inside to the outside spaces such as patios, roof decks, and pool side areas. This living room takes advantage of its adjacency to wide door openings and uses a wall mirror to further make the room feel more spacious. The white leather sofa and matching mid-century modern coffee and side tables all match well to the off-white porcelain tile flooring. This gives the room an overall clean and open feel with a slightly nautical theme shown in its decorating. Black and white motifs are staples in the interior design industry and this living room examples shows why that is. Its clear cut use of blacks and rich dark browns – in the moldings of the the window frames, barrel chair legs, and the central coffee table – create a heavy but naturally attractive contrast with the whites – the leather of the barrel chairs and love seat, as well as the walls. The black and white geometric and floral patterns found all over the space, in its cushions and various decors, add a nice final touch to the formal living space. The gray ash wide plank hardwood flooring creates a rustic feel to the space. The black leather club lounge chair is a daring and smart choice of furniture piece for this place. 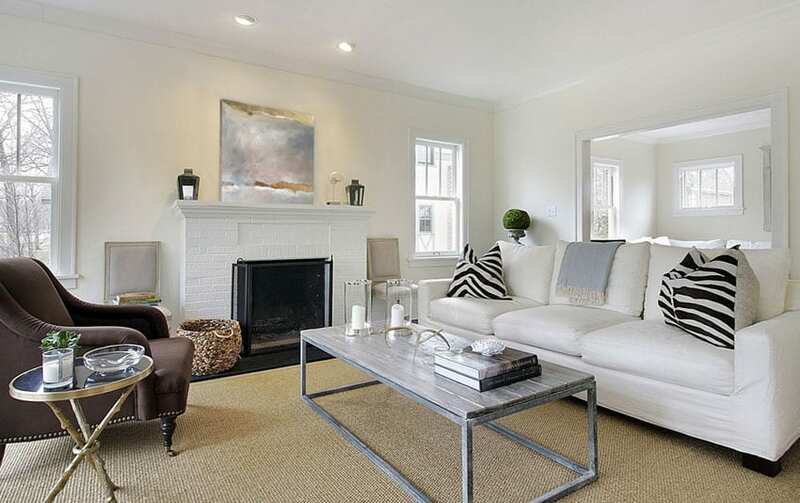 It works well with the glass and steel circular coffee table, the white and gray frieze rug, and the gray modern sofa. 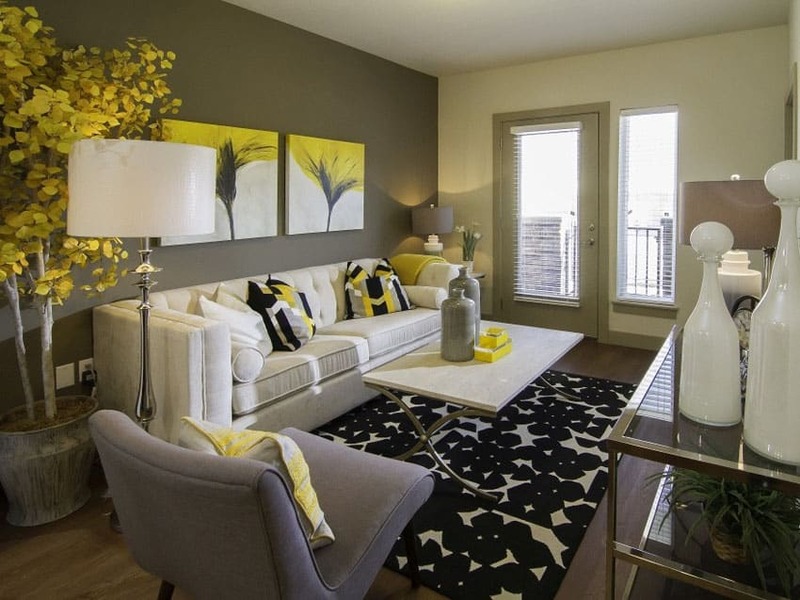 The gold, white, and black colors of the floral throw cushions, coffee table floral vase arrangement, and hung painting, add bold splashes of color to the room. The polished mahogany plank hardwood flooring is the perfect contrast to the blues and white of this space; it creates an attractive beach vibe to the room. The brown and white loop pile rug and white stone coffee table at the center of the space ties in all the pieces – the blue leather barrel chairs, the low back modern sofa, the brightly colored throw pillows, and the dried and artistic piece of plant decor at the corner of the living room. Pops of color can really enhance the beauty of a small living room layout as seen in this beach themed design. Curtain walls, walls that are comprised mainly of window elements, are one of the most effective ways of lighting up and opening up a space. In this example of an apartment living room, the wide windows give the room a spacious feel, in addition to the teak hardwood floor. The glass chandelier add a touch of class to the area and the sleek designs of the armless lounge chairs, modern-styled sofa, and glass top coffee table add style. 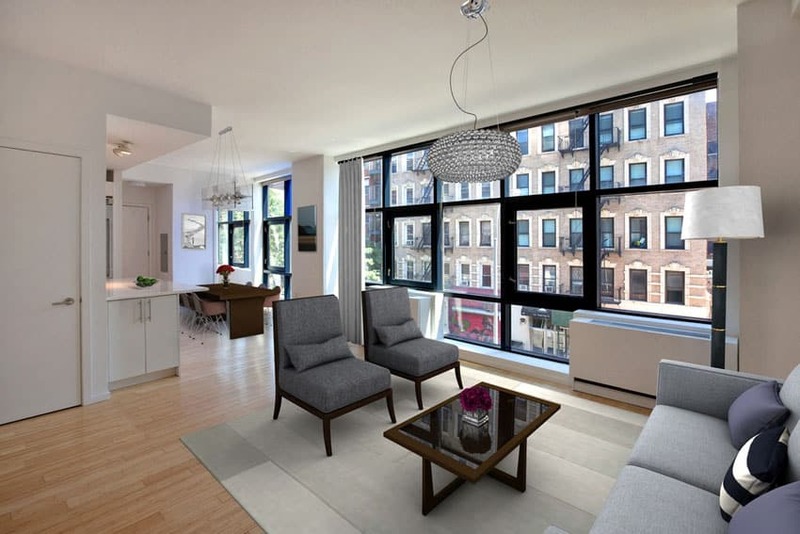 Large windows can definitely brighten up and enlarge the appearance of a small interior space. This example of a living room deals with a high ceiling. To keep the space feeling cozy and personal, the design employs two corner sofas that somehow frame the living room area. The gas fireplace, with its black travertine wall tiles, also add a more intimate feel to the space. 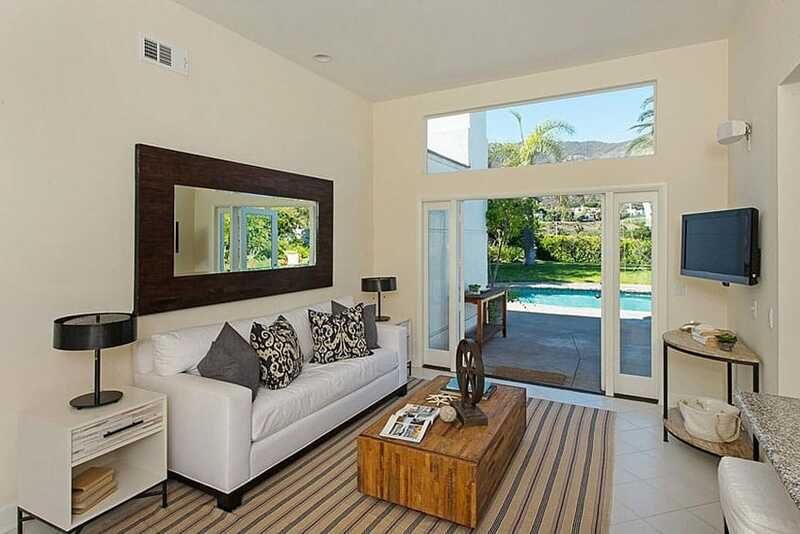 The white carpet, solid wood coffee table, and porcelain tile flooring keep the place feeling classy and modern. Variety in materials can do wonders in a space, especially in area as personal as a living room. 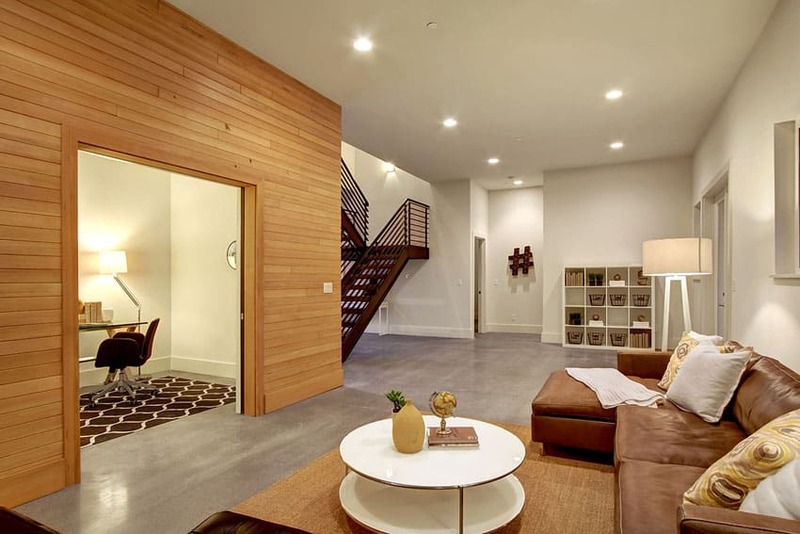 The warmth of the wooden plank wall pairs nicely with the coolness of the polished concrete floor. The black metal stairs in the background also add to the raw yet undeniably clean feel of the space. The brown mid-century modern sectional leather sofa, the circular stone coffee table, and the various selections of minimalist furniture complete the aesthetic. Color accents seem to define this living room design example. The splashes of yellow seen in the paintings on the wall, the leaves of the planter decor piece, and the various throw cushions and tabletop decor, makes the space unique and vibrant. The geometric rug and clean, modern marble coffee table also help give even more life to the space. The armless accent lounge chair and the white microfiber tuxedo sofa go well with the club floor lamp and table lamp. For rooms with mid to high ceiling heights, chandeliers can really help define the ambiance of the room. In this example, a contemporary take on the classic glass chandelier brightens up the room functionally and aesthetically. 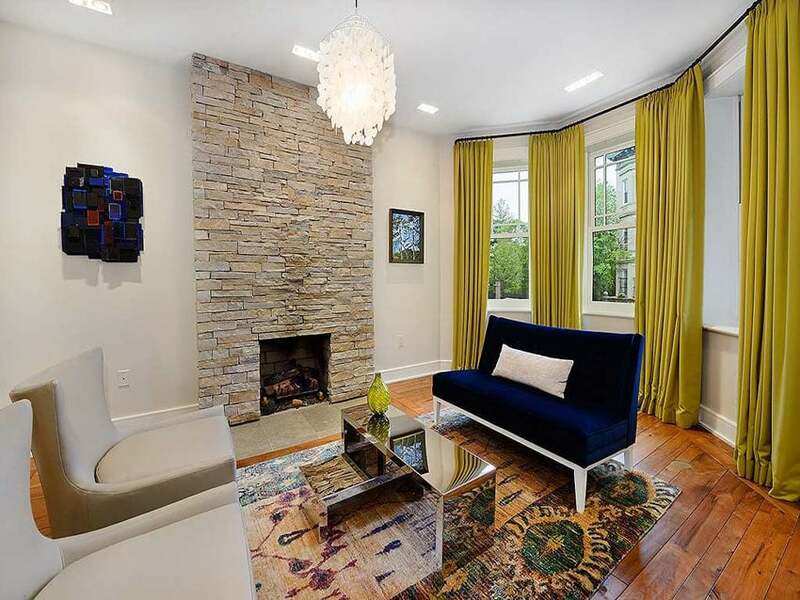 The travertine stone tile wood-burning fireplace also adds much charm as well. Additionally, the yellow wall-length curtains help make the colors of the room really pop. The chrome plated coffee table and foot rest, the armless dark navy sofa, and the leather lounge chairs add an additional touch of style to the space, while the stained mahogany wood flooring and uniquely-patterned Persian rug help it feel more like home. In this example, the skylight does wonders in brightening up the living room and the various elements in it. The charming ottomans and matching English sofa are the centerpieces of this living room. 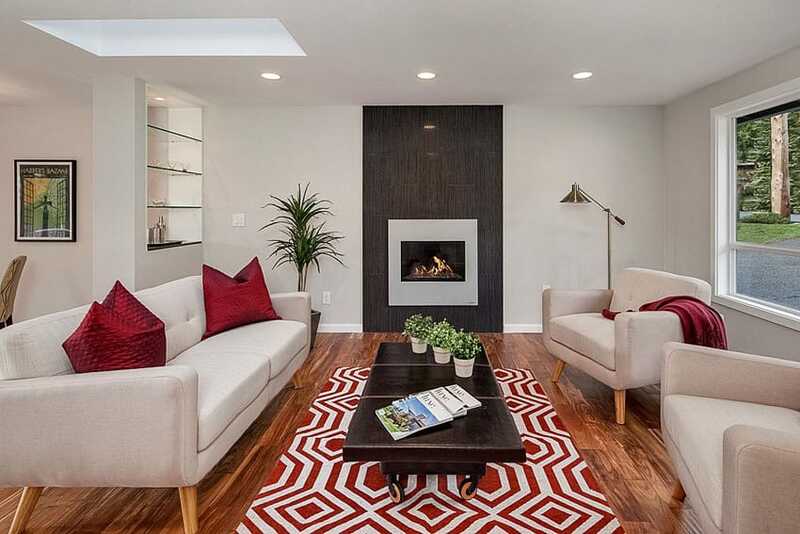 The light cherry hardwood floor is pleasantly complemented by the geometric blue fabric rug. The fireplace at the side, the tripod-base spherical floor lamp, and the stylish chrome side table all add even more brightness to the space.